Fruit juice is fruit juice, right? Not necessarily. While some juices you'll find in the store come straight from the fruit, others are made from a base of fruit concentrate: fruit juice with most of the water removed. No matter the source, the high-sugar content in fruit juice can be a problem. Furthermore, juices made from concentrate pack a few extra concerns of their own. Why is fruit concentrate so popular in the fruit juice industry? It might be tempting to assume that all the fruit juice you see in the store comes from somewhere nearby, but apple products, for example, are often shipped halfway around the world, given two of the world's biggest exporters, Poland and China. Once shipping is a factor, both weight and volume come at a premium. If that fruit is bound to become juice anyway, turning fruit juice into juice concentrate means it takes up a lot less space and is a lot lighter to ship than the final reconstituted product. 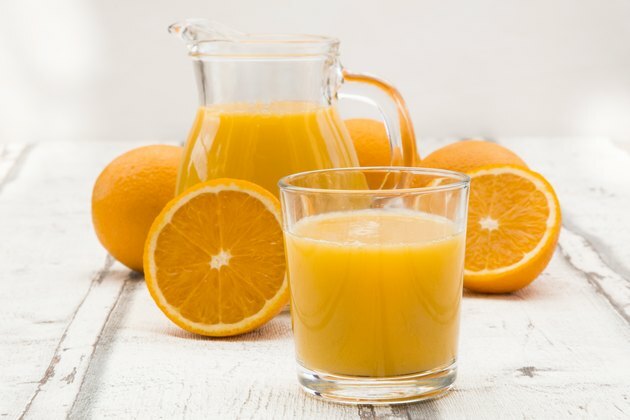 But even though shipping fruit juice concentrate over long distances can save money, using fruit juice concentrate introduces a series of problems for the end consumer, who doesn't know where the juice drink started its journey and therefore doesn't know under what types of standards it was grown and handled. Anyone who's mixed a half-frozen tube of orange juice concentrate with water to make juice knows that you can buy frozen fruit juice concentrate on its own and that the concentrated form of fruit juice has a longer shelf life than fresh juice; just leave it in the freezer until you want it. But many of the juice products you buy in the store are made from concentrate too. Check the fine print on the label and in the ingredients list for those magic words, "from concentrate." When you eat a whole apple, orange or handful of grapes, you get the same amount of natural sugar you'd get in juice made from the same quantity of fruit. But you're also getting lots of fiber that helps slow the absorption of the sugar into your system. When you drink fruit juice, regardless of whether it came from concentrate or not, you're getting all the sugar in the fruit with none of the fiber from the pulp. In the absence of that fiber to slow down the digestive process, sugars get into your bloodstream more quickly, causing your blood glucose levels to spike. Your body answers with high amounts of insulin, which can increase your risk of Type 2 diabetes and promote fat storage. You'll also find that fruit juice has more sugar and calories than the corresponding whole fruit, because you're concentrating the sugar and calories from multiple fruits into one serving. For example, a single orange has, on average, just under 12 grams of sugar, plus more than 3 grams of beneficial fiber, whereas an 8-ounce cup of orange juice has 24 grams of sugar and none of the fiber. Fiber also helps with satiety, keeps your bowels healthy and provides other health benefits, including reduced risk of heart disease and diabetes — all of which you miss when you drink fruit juice, whether from concentrate or not. Another nutrient concern that's specific to fruit juice from concentrate is that the heating process that removes the water also destroys the vitamin C content. Read more: What Are the Benefits of Drinking Apple Juice? Fruit juice is sweet enough on its own, but if a product isn't labeled as 100 percent juice, there's a chance that it may contain hidden sweeteners like high-fructose corn syrup. Although there has been debate over whether high-fructose corn syrup is more damaging to your body than other added sweeteners, a growing series of studies has indicated that it may be associated with negative effects such as disrupted metabolism and arthritis in young adults. Do you care where the fruit that goes into your fruit juice was grown and handled? You should, because not every country has the same controls in place to manage fruit production. In particular, China is an enormous exporter of apple juice concentrate, with a forecast export of up to 750,000 tonnes in 2018 — and in recent years, the U.S. has imported more than three-quarters of its juice concentrate from China. But Chinese farms are also known for their pollution and excessive use of fertilizers and pesticides, and some pesticides are known to work their way into fruit juices and concentrates. For example, carbendazim isn't permitted in the United States but can show up in juice concentrates from other countries. If you know the source of the fruit that goes into your juice, you can at least read up on that country's food safety regulations, waste management, whether its fruit is processed with industrial solvents or irradiation, and other factors that are of interest to many consumers. But when you get your juice from concentrate, you're often left to guess where the fruit started its journey. In 2019, Consumer Reports published the results from its testing of 45 popular fruit juices and juice blends sold across the United States, most from concentrate. In almost half the juices, it found elevated levels of the heavy metals arsenic, cadmium and lead — so elevated, in fact, that its chief scientific officer warned that, in some cases, drinking just half a cup of juice per day would be enough to cause concern. These heavy metals can present a heightened risk of lowered IQ, behavioral problems, Type 2 diabetes, cancer and more in children, while in adults, heavy metal exposure can elevate your risk of several cancers, Type 2 diabetes and other conditions. The report is especially concerning because some of the juices that showed these elevated levels are marketed for children, who are particularly vulnerable to the effects of heavy metals. Consumer Reports also noted that a recent survey of more than 3,000 parents showed that in 74 percent of those surveyed, kids drink juice once a day or more. But 10 of the juices tested also posed a potential health risk to adults who drink more than 8 ounces per day. (Half of those juices were also risky at just 4 ounces per day). Interestingly, the Consumer Reports testing found that organic juices did not show lower levels of heavy metals than conventional juices. Heavy metals and pesticides aren't the only dangerous substances that can creep into fruit and from there into the juice-from-concentrate products you buy off the shelf. Of particular note, patulin is a mycotoxin produced by fungi most commonly associated with moldy apples, although it has also been found in other juice-worthy fruits, including grapes, peaches, pineapple and apricots. Given the prevalence of fruit imports from China, it's also alarming that a 2017 issue of the journal Food Control showed that 17.5 percent of the fruit products tested in China exceeded the European Union's allowable standards for patulin contamination. Although there have been no widespread reports of illness caused by patulin, it can cause nausea and vomiting and is classified as a mutagen that can cause DNA damage. In 2017, the Safe Food Alliance reported that the FDA had classified it as a potential health risk in apple juice. Good harvest and storage practices are key in reducing the presence of patulin — which is another reason why the source of your fruit juice can matter quite a bit. Patulin has also been found to correlate with the presence of aflatoxin, another mycotoxin that is associated with an increased risk of liver cancer. If you're not comfortable with the implications of buying juice drinks made from concentrate, you have some alternatives. First, buy juice that's labeled "not from concentrate." Second, if you're lucky enough to live near fruit growers, you might even be able to buy juice directly from the farmer, or if juice is not available, consider investing in a juicer and buying "juice grade" fruit. (These fruits are nutritionally sound but tend to be odd-shaped or have a few cosmetic blemishes.) Juice the fruit yourself, and you'll enjoy the comfort of knowing where your food came from and how it was handled, and you can even find a way to sneak that juice pulp into nutritious recipes. Those options don't avoid the potential health risks associated with drinking fruit juice, but at least, you'll be able to pin down some of the "unknown" factors that come from using concentrate. You can also blend the whole fruits into a fruit smoothie, so you get the benefit of the fiber. Not a fan of smoothies? You can eliminate even more health risks if you're willing to swap fruit juice for healthier alternatives. Simply eat the whole fruit instead of drinking its juice, so you get the full benefit of its fiber and nutrients along with the reduced sugar concentration. Another option is to add a wedge of whole fruit to water to flavor it or to put a splash of fruit juice into club soda or seltzer water. Some people actually buy the juice concentrate itself for this use (as opposed to buying reconstituted juice from concentrate), but limiting the quantity of juice in your drink can help reduce some of the associated health risks. Consumer Reports: Is Fruit Juice Healthier Than Soda? NPR: What Is 'Fruit Concentrate,' Anyway? And Is It Good for You?